Talk of kosher wine cannot help but include side topics such as cost, countries, or quality. Funny thing is that except for a few wines from a couple of importers, kosher French wines have been rising in price, while prices from other kosher wine producing regions have been going down or staying the same. Clearly Israel has its own problems with sky-high prices for average to quality to wines, but it also has many wonderful QPR (Quality to Price Ratio) winners, like Galil, some Yarden, and Recanati. But looking at the prices of Vignobles David, on his website, you find that the kosher version is only a single Euro higher than its non-kosher counterpart. It would be really great if he released a kosher version of the Blanc Le Mourre De L’Isle, a Rhone GRV Blend (Roussanne 34%, Viognier 33%, Grenache blanc 33%)! Hagafen Winery and Royal’s Domaine l’Or de Line (also a White Rhone Blend of Grenache Blanc, Picpuol, Roussanne, Bourboulenc, Clairette and Picardin) are the kosher Roussanne wines that I know of. The wines are lovely, but a little competition goes a long way! The more white Rhone varietals we can get in the kosher world – the better! In the end, it was a great experience sitting with David and tasting his two wines. 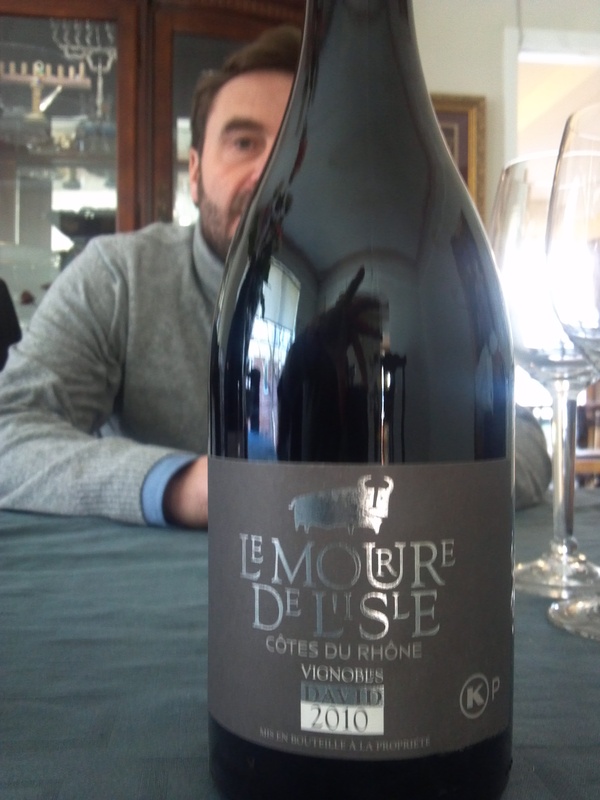 The Le Mourre de L’Isle Cotes du Rhone, continues to be a star in the QPR area, and always unique given the lack of quality kosher Grenache or Mourvedre, though this is the first year it is blended with Syrah, making it a true GSM (Grenache, Mourvedre, Syrah). Actually given its percentages, it could be called an SGM, though that is not an acronym that is used in the wine business, so we will stick with GSM. The wine blend that is GSM, was one of the hottest items in the wine world, with rave reviews on wines from Australia, the Rhone Rangers of California, and of course the original source for all things GSM – Cotes du Rhone! However, in recent time, Syrah/Shiraz and its ilk have been selling a bit more poorly here in the USA. The main reason for this problem is actually two fold, bad wine and the confusion caused by having two grape names that are the same varietal. On the subject of bad wine, there really is no answer. People see the word Syrah now days and they cringe, remembering the poor Syrah quality wines that lined the supermarket shelves. The Australians helped fix that with better Shiraz wine, but there is still the issue of which one is which! The Australians will tell you that they make Shiraz wine and they do it in their own way with brighter bigger fruit, along with lots of tannin and body. In comparison, the French will say that their Syrah wines are lighter, more elegant and refined, while still easily besting a grilled cotes du boeuf! While tasting David’ wines they do tend to live to the quality Syrah name, with rich acid to boot. The wines also channel a bit of the Shiraz name because of their rich fruit, though not in your face or overly hot, like his Australian counterparts. His wines also have a bit of that animal quality that is so lovely and rich, which makes it uniquely Cotes du Rhone. In the end the wines are true to the Syrah style, with a bit of extra fruit, which makes David happy as his passion and love for wine does evoke a real sense of pride about the grapes that are sourced from his vineyards. According to David, the Syrah adds the rich black and red fresh fruit, along with the nice tannin, and color. The Grenache for richness and spice, and the Mourvedre for structure and more color. The three varietals are located in 3 different locations in the vineyard which wee planted in three different soils. Any time you talk about a blend the question inevitably comes up, which is – how did you construct the blend and when in the maturation of the wine did you do the blending? 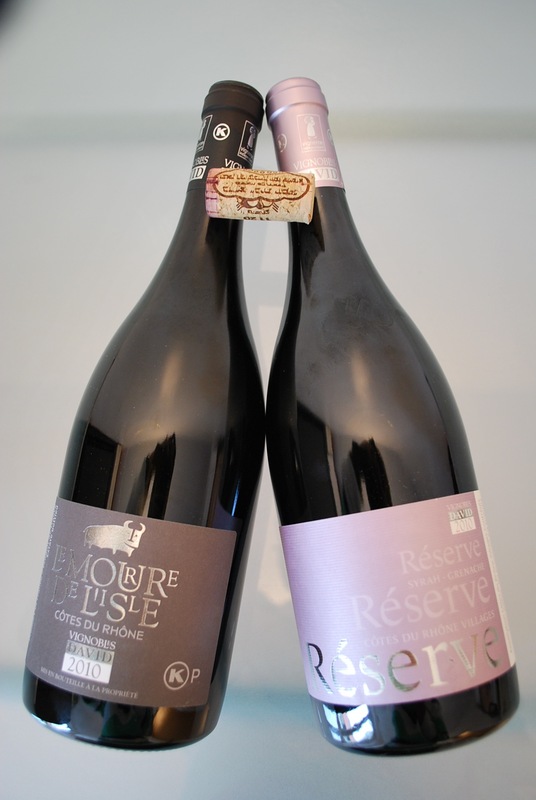 For the kosher Le Mourre de L’Isle, the recipe moves with the quality of the grapes, but normally a vat of Syrah is fermenting separately, along with a vat of Syrah / Grenache that is fermenting together, and depending of the vintage Mourvedre is fermenting alone or with a bit of an old plot of Grenache. The Syrah and Mourvedre are aged separated in larger format barrels (500 L) to limit oak influence, while the Grenache is mainly aged in concrete. Only after the wines have gone through malolactic fermentation (also known as second fermentation or malo), does David start to look at blending them and completing the final aging in a happy union. The conversation again moved, this time to David’s winery, and I could not help but ask about where the name for his Le Mourre de L’Isle comes from? Le Mourre de L’Isle is the name of a plot that I own which faces the roman aqueduct, Le Pont du Gard, answered David. He explained further “that when you are looking at Gardon River, which flows into the Rhone River some 10 miles downstream, you can see terraced vineyards, showing exposed red pebbles, typical of the Rhone soil, which has a form of a nose. Like an island going into a river. Literally, Le Mourre de L’Isle means the nose, the nose of the animal. This is also the reason for why there is a bull on the label“. As he was talking about his wines he let slip that he will be producing a very limited Chateauneuf du Pape, totaling 110 cases. 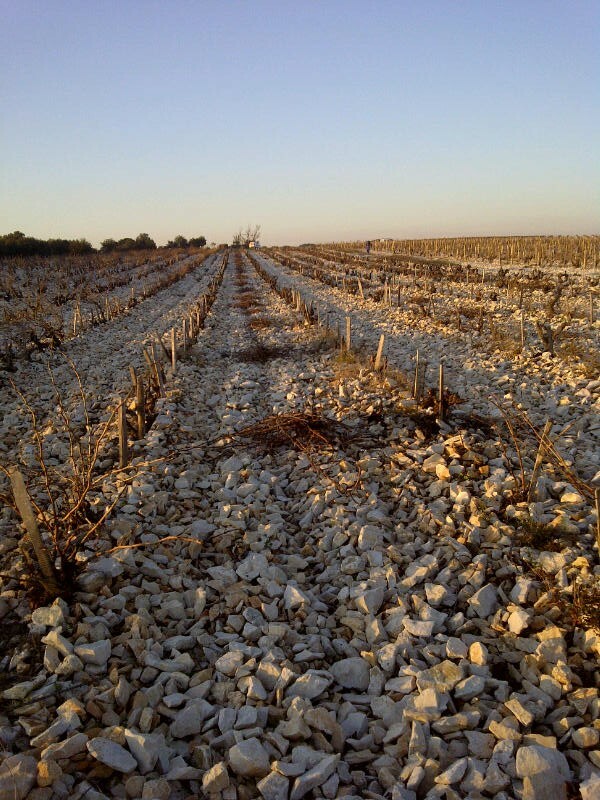 The plot is some 2 and half acres located in Chateauneuf du Pape. The vines are a mix of 55-year-old Grenache vines, along with some Syrah and Mourvedre, as well. Of course the vines are tended to in an organic manner and will not be released until it is ready, so we will have to wait to find out when this new wine will be available. With some Chateauneuf du Pape, David will have a nice line of Southern Rhone labels, from the basic Cotes du Rhone to the highly acclaimed Chateauneuf du Pape. What was missing was a wine in the middle. The Cotes du Rhone Villages AOC, or what he calls the 2010 Vignobles David Cotes du Rhone Villages Reserve, fills in the missing link. While talking about the Cotes du Rhone Villages, he said he had hoped to call it Oz. No, not in ANY WAY to promote any relationship with the Australian wines out there. Rather, because of its inner strength, grip, and power, or Oz in Hebrew. Also, because David loves Amos Oz’s books. Unfortunately, the trademark was taken in the US and in other locales where he sells his wine, so he fell back to reserve, which has no trademark issues. The new Reserve wine is a lovely almost full-bodied wine that really forces you to take notice. A clear next step for this winery and another wonderful example of what France has to offer in the $25 or lower category. The wine is a Grenache/Syrah (GS) blend and one with more earthiness than typically found in its Israeli or California counterparts. It may lack a bit of the extreme heft found in some of the Rhone Ranger wines from California, but they also have less acidity and minerality that David’s wines channel so well. As we were talking, inevitably, the conversation weaved its way through things that I cannot reprint, as I was asked not to, and because the content would not fit this blog. Still, it was while having these and other conversations with both David and Ghermezian, that I saw what people find so romantic about wine making and sometimes, wine business. That said, while the passion and drive in both of these men are real, the effort and work they apply to their crafts is equally as real, and something that I think most forget when they get all romantic about wine in general. The wine business can be a scorned wife or a passionate mistress, metaphorically speaking of course, with both and either being unhappy and throwing hissy fits all over the place. Of course, they can be deeply romantic but a scorned lover, no matter how passionate is always one cold day, bad crop, and/or extra hot day away from a full-blown disaster. I really love what the late Daniel Rogov said, channeling famous winemaker Andre Tchelistcheff’s axiom: “In a good year, don’t worry about the wine. God made the wine for you. In a bad year pray to God that your winemaker knows how to make wine”. 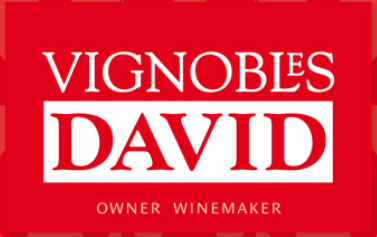 Sure, I am a sentimental sap, and spending time with these two gentlemen is sure to twist your objectivity, but to me Vignobles David has always been what it means. A family owned vineyard and winery managed by a passionate and capable man, whose last name is David and who is ever confident, both in his winemaking abilities and his spiritual connection with nature and God. As I was writing this article, Mr. David was coming back from the Concours des Vins à Orange competition, a wine competition showcasing Cotes du Rhone wines and the 2010 Reserve GS won a gold medal with congratulations. They loved the Reserve GS as much as I did, and I am sure you will like it as well, once you get to taste it. My many thanks to both Mr. Fred David and Mr. Ghermezian (and his lovely family), in whose house we met and who’s hospitality we all partook of, with coffee and cheese after the tastings. This wine blend is composed of 60% Syrah, 30% Grenache, 10% Mourvedre, also known by the folks in the know, as GSM, an acronym stemming from the first letter of the 3 varietals used in this blend. There really are few kosher GSM on the market, some from Israel, and one or two from France, and the rest from the Rhone Ranger winemakers of California. The nose on this dark garnet colored wine is filled with bramble, espresso coffee, lovely and balancing dirt, raspberry, heavy dark cherry, blackcurrant, cloves, black pepper, and cinnamon. The mouth on this medium-bodied wine is truly accessible with soft plush tannin, rich and ripe forest berries, and nice mouth rounding oak, all coming together with the truly important bracing core acidity. The finish is long and spicy with beautiful spice, ripe fruit, nice tannin, all coming to a lingering sense of light oak, fleeting vanilla, rich black pepper, and ripe black fruit. This wine is a great example of what rich acidity can do to a wine; it intensifies concentration and focus to good fruit, and makes the wine linger longer on the palate. This wine blend is composed of 40% Syrah, and 60% Grenache, also known by the folks in the know, as GS, an acronym stemming from the first letter of the 2 varietals used in this blend. This bright purple colored wine steps up and slaps you across the head with a crazy rich and heady nose of blackcurrant, bramble, rich oak, roasted meat, freshly brewed espresso, spice, raspberry, blackberry, and tar. This wine shows a super rich, full-bodied, yet bright mouth with mouth coating tannin, rich extraction, along with focused concentration of fruit, all coming together into a truly earthy, fruity, meaty mouth. The finish is richly spiced with layers of more coating tannin, soft leather, tar, black fruit, rich minerality, espresso and oak. Quite a lovely wine that is not another big and black Syrah, rather this is a lovely balanced GS that shows its richly spiced and terroir driven roots in more ways than one. Posted on February 12, 2012, in Kosher Red Wine, Kosher Wine, Wine, Wine Tasting and tagged Cotes Du Rhone, Cotes Du Rhone Villages, Le Mourre De Lisle, Reserve. Bookmark the permalink. 14 Comments.